"Dominicans define themselves in terms of who they are not," said Tamar Thompson, project coordinator of the New York-based National Coalition for Haitian Rights. "Globally speaking, there is no place where you score points for being darker." Thompson's words are reflected in the way citizens of the Dominican Republic describe their racial identities: "oscuro" for the darkest skinned, "canela" for those of medium hue, and "claro" for those with the lightest complexions. All are referred to as "Indians." None are referred to as "black." That word is only used to describe persons from the nation occupying the western one-third of Hispaniola, their shared Caribbean island. Much of Dominican self-identity is rooted in the Republic's long-standing rivalry with neighboring Haiti. Although Dominicans most closely identify with their former Spanish colonizers, their Independence Day, Feb. 27, celebrates the country's victory over Haiti in 1844. Antecedently, Haiti had ruled the Dominican Republic for 22 years. Although the two countries have not fought any wars since then, this period of subjugation has remained in Dominicans' collective consciousnesses. "There is a historical anti-Haitian feeling [among Dominicans]. They see Haitians as the enemy; as the people who can eventually take the whole island," says Dr. Miguel Anibal Perdomo, professor of Dominican Identity and Literature at Hunter College in New York City. Added to this collective bias is the view among many Dominicans that Haitians are culturally, economically, and socially inferior. Such stereotyping is characterized by the general distain for Haitian religious and cultural practices - referred to as "voodoo" - and for the recent election-related violence, joining the international perception of Haiti as a nation spinning out of control. Part of this anti-Haitian sentiment may lie in the way Dominicans view themselves. As in many Caribbean societies, skin color is often correlated with social and economic mobility. A booming industry has developed around the practice of straightening the otherwise naturally frizzy hair of many Dominican women. According to Cristina Jackson, 34, who moved to New York from the Dominican Republic ten years ago, skin color is a sign of social status: "Marrying a white man or a white woman is often viewed as strategic so as to 'improve the race,'" she said. Indeed, during the regime of Dominican General Rafael Trujillo (1930-1961), immigration from Europe and the United States was openly encouraged as a means of further whitening the population — a melting pot of Spanish, African, and Taino Indian. The upper classes tended to be of European stock. Anti-Haitian bias is most noticeable in the Dominican Republic's deportation policies, aimed not only at both legal and illegal Haitian workers, but also at Dominicans of Haitian descent and children born to Haitian parents. According to Thompson, over 15,000 Haitians have been deported from the Dominican Republic since May 2005. Many were simply seized, then dropped off at the Haitian border; a country which the deportees had likely never visited before. In addition, Haitian mothers are often denied birth certificates for newborn children delivered in Dominican hospitals, further complicating later proofs of Dominican citizenship. According to Thompson, "the Dominican Republic's response to Haitian births is 'we don't grant birth certificates because Haitians are in transit.'" While the Dominican constitution guarantees citizenship to all persons born within the country's borders, the law excludes those who are only briefly passing through on their way to some other destination. 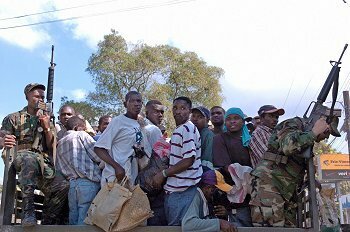 In a May 2002 report, Human Rights Watch called upon the Dominican government to establish a standard of due process in expelling illegal Haitian immigrants, while guaranteeing the rights of those granted citizenship due to their birth within the country as set out in their constitution. Officially, the Dominican government has publicly condemned the systematic abuse of Haitians. Yet such condemnations have done little to allay Haitian anger towards the Dominican government and its president, Leonel Fernandez, whom many blame for the prevailing anti-Haitian sentiment. During his most recent visit to Haiti in Dec. 2005, riots outside the presidential palace in Port-au-Prince forced Fernandez to cut short his visit with interim President Boniface Alexandre. According to the Christian Science Monitor, between 700,000 and one million Haitians are living illegally in the Dominican Republic. Despite the Republic's 17 percent unemployment rate, most come looking for low-paid, unskilled labor work, mainly in the sugar plantations which line the Haitian-Dominican border. Not unlike the United States, the Dominican Republic is dependent on the availability of cheap labor to meet the demands of a growing economy. However, with the current political turmoil in Haiti, the influx of refugees has swelled in recent months. According to a Feb. 7 report by the Miami Herald, mob violence and random acts of violence against Haitians has been on the rise, due both to competition for jobs and racial discrimination. Much of this weighs heavily on the minds of transplanted Dominicans in places like New York. "For me, this is very embarrassing," said Perdomo, a medium-complexioned Dominican who arrived in the United States 15 years ago. He believes that the decision to shift away from embracing an African heritage began centuries ago: "There was a sense of 'deculturación' among the African slaves of Hispaniola. [There was] an attempt to erase any vestiges of African culture from the Dominican Republic. We were, in some way, brainwashed and we've become westernized." Yet, upon arriving in New York, many Dominicans find that they face prejudices similar to those reserved for only the darkest among them in their home country. "Dominicans only discover the truth about not being white when they arrive in New York City," said Perdomo. Betsy Uribe, 33, who emigrated from the Dominican Republic in Oct. 2004, concurred: "I'm not saying we don't have racial problems; the rich will never allow a black to become president. People in the DR will say 'we don't discriminate,' but then they'll make excuses why they don't want them." View the Worldpress Desk’s profile for Jeffrey Zahka.